Even though we home school... I just really like singing that song!!! Well this year we did a different curriculum and we liked it, but we didn't love it.. and needless to say i really love singing that song!!!! Because i really mean it. Well, what does everyone have planned for the summer vacation.... anything exciting??? Well for me it all depends on all stars... my two boys... may make all stars even though i had asked them...Are you SURE you what to play if you get picked... and of course they were like... YEAH... of course we do... and i said OH! well then OK... so we will try and do some camping and some backpacking(the new hobby). My husband wants to summit the highest peak in Arizona... Mt Humphreys. oh with me tagging along with him... which i am thinking.... are you supposed to be like training for something like that??? Well we will see, also maybe a trip to my parents house in No. Cal. Should be fun!!!!!! 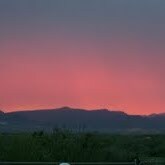 A little Arizona sunset for ya!!! What is on your summer time list????? To come see you, of course!!!!! Ok so it has been foreva since we have talked. I need to hear all about this new hobby! Get your little buns out here already!!! i can't wait to see you all!! !